For permanent marking on most surfaces. Intense, highly visible, quick drying colors are water and weather resistant. Precision valve regulates paint flow. For use on metal, plastic, rubber, wood, ceramics, glass, textiles, cement and more. Includes 10cc's of paint. Bulk. Intense, highly visible, quick drying colors are water and weather resistant. Precision valve regulates paint flow. For use on metal, plastic, rubber, wood, ceramics, glass, textiles, cement and more. Includes 10cc's of paint. Features high impact scratch resistant polycarbonate lenses and non-slip temples. Provides 99.9% UV protection. Meets ANSI Z87.1+safety standards. Features a square hood and round file with a patented assembly. Carefully manufactured for sound, solid connections and trouble-free service. Easily crimped or swaged. Made from electrolytic copper rated for 100% conductivity. Carded 2-pack. Carefully manufactured for sound, solid connections and trouble-free service. Easily crimped or swaged. Made from electrolytic copper rated for 100% conductivity. Carded 2-pack. Carefully manufactured for sound, solid connections and trouble-free service. Easily crimped or swaged. Made from electrolytic copper rated for 100% conductivity. Carded 2-pack. Constructed with an inner sleeve collet to separate the soapstone for maximum grip and protection. Slim line brass holder with a convenient deluxe pocket clip. Easily adjustable. Includes four (4) replacement triangles for a total of 12 flints. General uses: joins copper to copper; refrigeration; electrical; plumbing. Tube brush with wire loop-end handle. Single stem/single spiral with .005" (.127mm) nylon bristles. Ideal for cleaning bottles, carburetors, brake cylinders, radiator hoses, engine blocks, blocked hoses, drains, etc. Tube brush with wire loop-end handle. Single stem/single spiral with .005" (.127mm) nylon bristles. Ideal for cleaning bottles, carburetors, brake cylinders, radiator hoses, engine blocks, blocked hoses, drains, etc. For permanent marking on most surfaces. Intense, highly visible, quick drying colors are water and weather resistant. Precision valve regulates paint flow. For use on metal, plastic, rubber, wood, ceramics, glass, textiles, cement and more. Includes 10cc's of paint. Carded. For permanent marking on most surfaces. Intense, highly visible, quick drying colors are water and weather resistant. Precision valve regulates paint flow. For use on metal, plastic, rubber, wood, ceramics, glass, textiles, cement and more. Includes 10cc's of paint. Carded. For permanent marking on most surfaces. Intense, highly visible, quick drying colors are water and weather resistant. Precision valve regulates paint flow. For use on metal, plastic, rubber, wood, ceramics, glass, textiles, cement and more. Includes 10cc's of paint. Carded. Replacement shade 2" (50.8mm) x 4-1/4" (107.95mm). For prolonged periods of welding and/or to see true flame arc and puddle color. The gold coating reflects 90% of radiated heat for cooler operation and less eye fatigue. Provides UV/IR protection. Meets ANSI Z87.1 Safety Standards. Fits Forney 55663 ("Slim Line"), 55666 ("Bandit I"), and 55680 ("Super Slim") welding helmets and most brand name helmets using a 2" (50.8mm) x 4-1/4" (107.95mm) window opening. Replacement Lens, 5-1/4" x 4-1/2". Meets ANSI Z87.1 Safety Standards. Fits Forney 55647 ("Patriot"), 55669 ("Finish Line"), 55672 ("Bandit III"), 55673 ("Bandit II"), 55684 ("Titan") and 55686 ("Super Slim") welding helmets and most brand name helmets. UV/IR protection. Carefully manufactured for sound, solid connections and trouble-free service. Easily crimped or swaged. Made from electrolytic copper rated for 100% conductivity. Carded 2-pack. Carefully manufactured for sound, solid connections and trouble-free service. Easily crimped or swaged. Made from electrolytic copper rated for 100% conductivity. Carded 2-pack. Strong and durable with solidly imbedded bristles. Will not rust. Long wood handle with pre-drilled hang hole. Ideal for general purpose cleaning and excellent for cleaning stainless steel. Features .006" (.15mm) brass wire in 3 x 7 rows. Carefully manufactured for sound, solid connections and trouble-free service. Easily crimped or swaged. Made from electrolytic copper rated for 100% conductivity. Carded 2-pack. Quality tool with a rugged frame and three (3) large flints. Long lasting round file and bright plated finish. Dependable ignition under all working conditions. Release slotted screw to rotate fresh flint into position. Strong and durable with solidly imbedded brass bristles. Will not rust. Long curved wood handle with pre-drilled hang hole. Ideal for general purpose cleaning and excellent for finish or delicate cleaning of stainless or polished steel. Angle head design eliminates cut or bruised knuckles. Features .006" (.15mm) brass wire in 2 x 9 rows. Strong and durable with solidly imbedded carbon steel (CS) bristles. Curved wood handle with pre-drilled hang hole. Ideal for aggressive cleaning and removing rust and paint from most surfaces. Angled head design eliminates cut and bruised knuckles. Feature .014" (.36mm) CS wire. Forney Industries Welding Helmet Safety Lens, Replacement, Suitable For Use With: 55652 Welding Helmets, Plastic, Clear Strong and durable with solidly imbedded carbon steel (CS) bristles. Curved wood handle with pre-drilled hang hole. Ideal for aggressive cleaning and removing rust and paint from most surfaces. Angled head design eliminates cut and bruised knuckles. Feature .014" (.36mm) CS wire. Strong and durable, solidly imbedded brass bristles, with pre-drilled hang hole. Will not rust. Ideal for general purpose cleaning and excellent for cleaning stainless steel. Features .012" (.33mm) brass wire in 4 x 16 rows. Replacement Lens, 5-1/4" x 4-1/2". Meets ANSI Z87.1 Safety Standards. Fits Forney 55647 ("Patriot"), 55669 ("Finish Line"), 55672 ("Bandit III"), 55673 ("Bandit II"), 55684 ("Titan") and 55686 ("Super Slim") welding helmets and most brand name helmets. UV/IR protection. E6013 an all-position, general purpose rod with medium to shallow penetration; medium to heavy slag is easily removed; excellent for poorly fitted joints; smaller sizes of rod are well suited to low heat on thin metals; use on all types of mild steel where ease of operation and good appearance is required; great for light gauge metal, sheet metal, duct work, etc. Recommended Polarity: AC, DCEP, DCEN (Either Polarity). Tensile Strength (PSI): 83,000. Amperage: 50-70 on sku # (890.9806) the Amperage is 30-50. E7018 mild steel welding rod easily produce quality results on smaller amperage AC/DC welders; suitable for all positions on harden steels where no preheat is used and on cold rolled steels normally exhibiting excessive porosity when welded with conventional rod; the low hydrogen content reduces cracking and peeling of the weld material; features excellent restart capability; designed for welding low, medium and high carbon steels as well as some higher strength low alloy steel; for frames, trailer hitches and chassis. Recommended Polarity: AC, DCEN, DCEP (Reverse). Tensile Strength (PSI): 84,000. Amperage: 100-140 on sku #s (890.9624, 890.9632) Amperage: 140-190. Strong non-switchable magnetic that sticks to any iron object. Includes 45, 90 and 135 degree angles. Excellent "3rd hand" for welding, soldering, assembly, pipe installation, marking, floating and separating thin metal stacks. Strong and durable with solidly imbedded carbon steel (CS) bristles. Long curved wood handle with pre-drilled hang hole. Ideal for aggressive cleaning and removing rust and paint from most surfaces. Angled head design eliminates cut and bruised knuckles. Features .014" (.36mm) diameter. Includes metal scraper. Marks on dry, wet and oily surfaces. Visible when hot. Resists flame and heat. Use on stainless steel, plastic, aluminum, lumber, tile, glass and more. Shatter resistant and stays sharp. Constructed with an inner sleeve collet to separate the soapstone for maximum grip and protection. Slim line holder with a convenient deluxe pocket clip. Easily adjustable. MIG contact tips are compatible with "Forney" (00306 and 00308), "Tweco", "Binzel" or "Clarke" MIG guns. It is precision machined. 4-pack. MIG contact tips are compatible with "Forney" (00306 and 00308), "Tweco", "Binzel" or "Clarke" MIG guns. It is precision machined. 4-pack. MIG contact tips are compatible with "Forney" (00306 and 00308), "Tweco", "Binzel" or "Clarke" MIG guns. It is precision machined. 4-pack. MIG contact tips are compatible with "Forney" (00306 and 00308), "Tweco", "Binzel" or "Clarke" MIG guns. It is precision machined. 4-pack. High carbon steel, tempered chisel on one end and point on the other. Black. Durable. All-purpose. Shock proof handle with loop for belt hook. High carbon steel. Tempered chisel on one end and point on the other. Durable. All-purpose. Shock proof handle with loop for belt hook. Strong and durable with solidly imbedded carbon steel (CS) bristles. Long curved wood handle with pre-drilled hang hole. Ideal for aggressive cleaning and removing rust and paint from most surfaces. Angled head design eliminates cut and bruised knuckles. Features .014" (.36mm) diameter. Includes metal scraper. Strong and durable with solidly imbedded stainless steel (SS) bristles. Long curved wood handle with pre-drilled hang hole. Excellent for general purpose cleaning of cook-out grills, in dairy operations, restaurants and surfaces exposed to high humidity. Angled head design eliminates cut and bruised knuckles. Features .006" (.15mm) diameter. Durable, with a polypropylene handle and bristles. Resistant to most auto parts cleaning solutions. One-piece unitized brush vulcanized in rubber. Metal ferrule for more support and durability plus a slightly heavier fill. Use to clean motors, machinery and metal parts. Good for removing gasket material or baked-on varnish. For permanent marking on most surfaces. Intense, highly visible, quick drying, water and weather resistant. Precision valve regulates the paint flow. For use on metal, plastic, rubber, wood, ceramics, glass, textiles, cement and more. Includes a 3/4" (19.05mm) barrel, 17cc's of paint, and a large nib that allows for either a 5/16" (7.94mm), 3/16" (4.76mm) or 1/8" (3.18mm) stroke width. For permanent marking on most surfaces. Intense, highly visible, quick drying, water and weather resistant. Precision valve regulates the paint flow. For use on metal, plastic, rubber, wood, ceramics, glass, textiles, cement and more. Includes a 3/4" (19.05mm) barrel, 17cc's of paint, and a large nib that allows for either a 5/16" (7.94mm), 3/16" (4.76mm) or 1/8" (3.18mm) stroke width. For permanent marking on most surfaces. Intense, highly visible, quick drying, water and weather resistant. Precision valve regulates the paint flow. For use on metal, plastic, rubber, wood, ceramics, glass, textiles, cement and more. Includes a 3/4" (19.05mm) barrel, 17cc's of paint, and a large nib that allows for either a 5/16" (7.94mm), 3/16" (4.76mm) or 1/8" (3.18mm) stroke width. For permanent marking on most surfaces. Intense, highly visible, quick drying, water and weather resistant. Precision valve regulates the paint flow. For use on metal, plastic, rubber, wood, ceramics, glass, textiles, cement and more. Includes a 3/4" (19.05mm) barrel, 17cc's of paint, and a large nib that allows for either a 5/16" (7.94mm), 3/16" (4.76mm) or 1/8" (3.18mm) stroke width. Intense, highly visible, quick drying color that is water and weather resistant. Precision valve regulates the paint flow. For use on metal, plastic, rubber, wood, ceramics, glass, textiles, cement and more. Includes a 3/4" (19.05mm) barrel, 17cc's of paint, and a large nib that allows for either a 5/16" (7.94mm), 3/16" (4.76mm) or 1/8" (3.18mm) stroke width. Specifically designed to fit smaller, narrower faces. These include a deep temple design that provides good side impact protection. The clear lens is best used indoors or at night. Meets ANSI Z87+, CSA Z94.3, and MIL-PRF-31013 ballistic standards. Forney Industries Welding Helmet Cover Lens, Replacement, Suitable For Use With: 55652 and 55653 Welding Helmets, Plastic, Clear Replacement Lens, 5-1/4" x 4-1/2". Meets ANSI Z87.1 Safety Standards. Fits Forney 55647 ("Patriot"), 55669 ("Finish Line"), 55672 ("Bandit III"), 55673 ("Bandit II"), 55684 ("Titan") and 55686 ("Super Slim") welding helmets and most brand name helmets. UV/IR protection. Excellent cleaning flux for use with all flame torches. Comes in easy to use, re-sealable tube. E6013 an all-position, general purpose rod with medium to shallow penetration; medium to heavy slag is easily removed; excellent for poorly fitted joints; smaller sizes of rod are well suited to low heat on thin metals; use on all types of mild steel where ease of operation and good appearance is required; great for light gauge metal, sheet metal, duct work, etc. Recommended Polarity: AC, DCEP, DCEN (Either Polarity). Tensile Strength (PSI): 83,000. Amperage: 50-70 on sku # (890.9806) the Amperage is 30-50. E7018 AC mild steel welding rod easily produce quality results on smaller amperage AC/DC welders; suitable for all positions on hardened steels where no preheat is used and on cold rolled steels normally exhibiting excessive porosity when welded with conventional rod; the low hydrogen content reduces cracking and peeling of the weld material; features excellent restart capability; designed for welding low, medium and high carbon steels as well as some higher strength low alloy steel; for frames, trailer hitches and chassis. Recommended Polarity: AC, DCEN, DCEP (Either Polarity). Tensile Strength (PSI): 84,000. Amperage: 65-100 on the 10 LB rods 140-190. Individual electrode (rod) weighs .50 lbs (.75 oz). E6011 an all-position rod with strong arc force for deep penetration; fast metal solidification facilitates welding in vertical and overhead positions; light slag allows for easy clean-up; excellent for rusty steel because of the strong arc force; useful for galvanized tanks, steel casting and pressure pipe. Recommended polarity: AC, DCEP, DCEN (Either Polarity). Tensile Strength (PSI): 88,000. Amperage: 25-75 on sku #s (890.9665, 890.9673, 890.9681) Amperage: 35-125 on sku #s (890.9707, 890.9715, 890.9723) Amperage: 50-160. General purpose, high quality rod for repair of low carbon steels. 6 rods. Copper coated rod has .06% max carbon and .17% max manganese. For projects around the house or commercial use. Red color coded. Tensile Strength: 45,000 PSI Melting Point: 2,700 degrees F (1,482 degrees C). 6 Rods. Replacement MIG contact tip for "Hobart Handler" 135, 140 ("Forney" 00355), 175 and 187 ("Forney" 00356) and "Ironman 210" ("Forney" 00362) and 250 ("Forney 00361). 3-pack. Tip cleaner kit provides as many as 60 or more cleaning edges per inch of cleaner. Fits all tip sizes. Light and easy to use. Contains 11 sizes - 6 through 26. Aluminum case includes dressing tool. Useful marking tool featuring a handy pocket clip, knurled aluminum handle and tungsten carbide tip. Cuts glass. General purpose, high quality rod for repair of low carbon steels. 6 rods. Copper coated rod has .06% max carbon and .17% max manganese. For projects around the house or commercial use. Red color coded. Tensile Strength: 45,000 PSI Melting Point: 2,700 degrees F (1,482 degrees C). 6 Rods. Tip cleaner kit provides as many as 60 or more cleaning edges per inch of cleaner. Fits all tip sizes. Light and easy to use. Contains 11 sizes - 6 through 26. Aluminum case includes dressing tool. For cleaning tight hard-to-reach areas in cook-out grills, dairy operations, restaurants, boats and areas where humidity is a problem. Ideal for cleaning most aluminum. Features pre-drilled hang hole and .014" (.36mm) stainless steel wire in 3 x 19 rows. Replacement clear grinding shield for "Forney" 58600 (sku # 891.0275) and 58605 grinding shield assemblies. Meets ANSI Z87.1 safety standards. NOT TO BE USED FOR OXY-ACETYLENE WELDING. Replacement shade 5-1/4" (133.35mm) x 4-1/2" (114.3mm) glass welding filter lens. For prolonged periods of welding and/or to see true flame arc and puddle color. The gold coating reflects 90% of radiated heat for cooler operation and less eye fatigue. Provides UV/IR protection. Meets ANSI Z87.1 Safety Standards. Fits Forney 55647 ("Patriot"), 55669 ("Finish Line"), 55672 ("Bandit III"), 55673 ("Bandit II"), 55684 ("Titan") and 55686 ("Super Slim") welding helmets and most brand name helmets using a 5-1/4" (133.35mm) x 4-1/2" (114.3mm) window opening. Replacement shade 5-1/4" (133.35mm) x 4-1/2" (114.3mm) glass welding filter lens. For prolonged periods of welding and/or to see true flame arc and puddle color. The gold coating reflects 90% of radiated heat for cooler operation and less eye fatigue. Provides UV/IR protection. Meets ANSI Z87.1 Safety Standards. Fits Forney 55647 ("Patriot"), 55669 ("Finish Line"), 55672 ("Bandit III"), 55673 ("Bandit II"), 55684 ("Titan") and 55686 ("Super Slim") welding helmets and most brand name helmets using a 5-1/4" (133.35mm) x 4-1/2" (114.3mm) window opening. Split leather palm and back. 4" safety cuff offers extra wrist and forearm protection. Cotton lining for moisture absorption. "Forney" imprint on glove. Includes 2 barbed hose splicers and 4 hose ferrules. Includes 2 barbed hose splicers and 4 hose ferrules. 15-1/2" (393.7mm) x 8" (203.2mm) replacement green grinding shield for Forney 58604 and 58606 grinding shield assemblies. Meets ANSI Z87.1 Safety Standards. NOT TO BE USED FOR OXY-ACETYLENE WELDING. Split cowhide welders glove with 14" flared gauntlet cuff and wing thumb with full sock lining. 8" (203.2mm) long with 1-3/4" (44.4mm) wide jaw opening. Accepts up to #2 welding cable. Rugged, economical ground clamp for shop maintenance and field work. Good positive connection. Suitable for all farm and shop welders. Prevents weld spatter from adhering to MIG nozzles, contact tips, weld area and work surface. Eliminates erratic operation with a film that will not clog orifices and threads on MIG nozzles and contact tips. Suitable for use on fixtures of semi- and automatic welders. Odorless, non-flammable, non-toxic and silicone free, it will not cause porosity. Strong non-switchable magnetic that sticks to any iron object. Includes 45, 90 and 135 degree angles. Excellent "3rd hand" for welding, soldering, assembly, pipe installation, marking, floating and separating thin metal stacks. Made of high impact polypropylene plastic. Includes four (4) internal compartments to separate rod. Screw-type cap and rubber o-ring provide clean, dry, air-tight storage for electrodes. Store up to 10 Lbs. Tempered steel chisel to resist dulling during heavy duty usage. Impact resistant handle. Removable and replaceable brush (Forney 70501) for cleaning. 12" (304.8mm) overall length. A general purpose repair kit containing (1) each easy-pick hook (o-ring remover), easy-pick 90 degree scribe, easy-pick double scribe and easy-pick straight scribe. Strong non-switchable magnetic that sticks to any iron object. Includes 45, 90 and 135 degree angles. Excellent "3rd hand" for welding, soldering, assembly, pipe installation, marking, floating and separating thin metal stacks. Replacement ratcheting-type headgear for "Fornery" 55666 (sku # 891.0069), 55673 (sku # 891.0077), 55697 ("Insta-Shade II") and old-style 55699 ("Insta-Shade III" - two control knobs on outside of helmet) welding helmets. E6013 an all-position, general purpose rod with medium to shallow penetration; medium to heavy slag is easily removed; excellent for poorly fitted joints; smaller sizes of rod are well suited to low heat on thin metals; use on all types of mild steel where ease of operation and good appearance is required; great for light gauge metal, sheet metal, duct work, etc. Recommended Polarity: AC, DCEP, DCEN (Either Polarity). Tensile Strength (PSI): 83,000. Amperage: 50-70 on sku # (890.9806) the Amperage is 30-50. Featuring 2" (50.8mm) x 4-1/4" (107.95mm) #5 shade hardened lens with clear glass cover lens. Meets ANSI Z87.1 safety standards. Conforms comfortably to the head and allows ample room to fit over regular eye glasses. Provides 99.9% UV protection. DESIGNED FOR GAS WELDING ONLY. Include patented temple technology designed to relieve pressure on the ear while providing excellent stability and comfort. Additional features include an integrated brow guard that provides protection from falling debris and a one-piece wrap around lens that provides additional side impact protection. These clear lenses are best used for indoor/outdoor use or at night. Meets ANSI Z87+, CSA Z94.3, and MIL-PRF-31013 ballistic standards. Wing design temples that alleviate pressure across the temple and pinching on the ear. Floating lens design helps to prevent fogging and the rubber nose piece provides additional comfort. Meets ANSI Z87+, CSA Z94.3, and MIL-PRF-31013 ballistic standards. Split leather palm and back. Extended gauntlet safety cuff offers extra wrist and forearm protection. Cotton lining for moisture absorption. Self-hemmed welting's in seams to provide extra strength to seams adding durability and strength to the glove. "Forney" imprint on glove. Split leather palm and back. Extended gauntlet safety cuff offers extra wrist and forearm protection. Cotton lining for moisture absorption. Self-hemmed welting's in seams to provide extra strength to seams adding durability and strength to the glove. "Forney" imprint on glove. Split Leather palm and back. Extended Gauntlet safety cuff offers extra wrist and forearm protection. Fortified with heat resistant Kevlar thread for added durability and wear. Cotton fleece lining for moisture absorption. Self-hemmed welting's in seams to provide extra strength to seams adding durability and strength to the glove. Forney?s emblem imprint on glove. Extended Gauntlet safety cuff offers extra wrist and forearm protection. Cotton lining for moisture absorption. Self-hemmed welting's in seams to provide extra strength to seams adding durability and strength to the glove. Forney?s emblem imprint on glove. Extended gauntlet safety cuff offers extra wrist and forearm protection. Cotton lining for moisture absorption. Self-hemmed welting's in seams to provide extra strength to seams adding durability and strength. Forney imprint on glove. Balanced zinc and copper alloy. Features excellent ductility and is smooth flowing. Excellent for brazing sheet metal, pipes, fenders, water tanks and many cast iron applications. Requires flux. Yellow color coded. Tensile Strength: 63,000 PSI Melting Point: 1,620 degrees F (882degrees C). 6 rods. General purpose rod with medium to shallow penetration. Medium to heavy slag is easily removed. Excellent for poorly fitted joints. Smaller sizes of rod are well suited to low heat on thin metals. Use on all types of mild steel. Great for light gauge metal, sheet metal, duct work, etc. Recommended Polarity: AC, DCEP, DCEN (Either Polarity). Tensile Strength (PSI): 83,000 Amperage: 70-110. Commercial-grade battery charger clamps with parrot-style zinc-plated jaws. Includes positive and negative clamps. Accepts up to #2 gauge cable. heavy duty construction and easy grip handles. Wing design temples that alleviate pressure across the temple and pinching on the ear. Floating lens design helps to prevent fogging and the rubber nose piece provides additional comfort. Meets ANSI Z87+, CSA Z94.3, and MIL-PRF-31013 ballistic standards. ER 70S-6 mild steel. Ideal for auto body repair and fabrication on most ferrous metals. Contains a high level of manganese and silicon for a superior weld, even on rusty, dirty steel. Produces a smooth bead which requires less grinding. Not recommended for aluminum engines. Yellow color coding on label. Required shielding gas: Argon/CO2. Recommended Polarity: DCEP Reverse Polarity. Tensile Strength (PSI): 70,000. Wt. 2 lb. Heavy-duty, bakelite crowfoot-design electrical receptacle with 2-pole/3-wire grounding for surface mounting. NEMA 10-50. 2" (50.8mm) face with 1/4" (6.35mm) national pipe thread (NPT). Features threads that are common to "Forney", "Victor", "Harris", "Smith" and "Marquette" compatible regulators. Solid brass threads and brass casings provide extra long life. 2" (50.8mm) face with 1/4" (6.35mm) national pipe thread (NPT). Features threads that are common to "Forney", "Victor", "Harris", "Smith" and "Marquette" compatible regulators. Solid brass threads and brass casings provide extra long life. 8-3/8" (212.8mm) long with 2" (50.8mm) maximum jaw opening and 2-1/2" - 3" (63.5mm - 76.2mm) depth. Designed to grip a few inches from the end of the metal. Allows weld to start or finish at the end of the joint. NOT TO BE USED FOR SCAFFOLDING OR OVERHEAD LIFTING. Twelve (12) high carbon steel tip drills stored in a barrel. Sizes #52 through 74 within a pencil compatible design. Includes pocket clip. 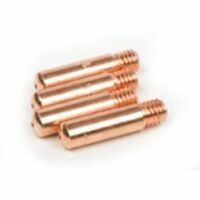 Used to clean and true most standard orifices of acetylene welding and cutting tips. Use "Forney" 86139 for replacement cleaning drills. Wing design temples that alleviate pressure across the temple and pinching on the ear. Floating lens design helps to prevent fogging and the rubber nose piece provides additional comfort. Meets ANSI Z87+, CSA Z94.3, and MIL-PRF-31013 ballistic standards. Anti-fog coating, contour design temple tips that softly hug the head and alleviate pinching, as well as an adjustable length eyewear retainer. Meets ANSI Z87+, CSA Z94.3, and MILSPEC standards for impact and ballistic standards. Anti-fog coating, contour design temple tips that softly hug the head and alleviate pinching, as well as an adjustable length eyewear retainer. Meets ANSI Z87+, CSA Z94.3, and MILSPEC standards for impact and ballistic standards. Clear lens and anti-fog coating. Includes temple and head straps which allow an individual to swap between safety glasses and goggles. Soft foam lining around the frame which block out debris. Meets ANSI Z87+, CSA Z94.3, and MILSPEC standards for impact and ballistic standards. Colorful and sporty looking 100% cotton cap that resists sparks. Bill assembled with multi-layers of cloth for flexibility. Multi-colored, reversible. Assorted colors available. Colorful and sporty looking 100% cotton cap that resists sparks. Bill assembled with multi-layers of cloth for flexibility. Multi-colored, reversible. Assorted colors available. Magnifying Lens, 2" (50.8mm) x 4-1/4" (107.95mm) welding lens. Allows user to weld with or without eye glasses. Meets ANSI Z87.1 Safety Standards. Fits Forney 55680 ("Super Slim") welding helmets and most brand name helmets using 2" (50.8mm) x 4-1/4" (107.95mm) window opening. Magnifying Lens, 2" (50.8mm) x 4-1/4" (107.95mm) welding lens. Allows user to weld with or without eye glasses. Meets ANSI Z87.1 Safety Standards. Fits Forney 55680 ("Super Slim") welding helmets and most brand name helmets using 2" (50.8mm) x 4-1/4" (107.95mm) window opening. Formulated for high tensile strength and ductility. Smooth flowing. Excellent for most brazing uses. Flux coated for best cleaning action. Yellow color coded. Tensile Strength: 65,000 PSI. Melting Point: 1,598? F (870? C). ER 70S-6 mild steel. Ideal for auto body repair and fabrication on most ferrous metals. Contains a high level of manganese and silicon for a superior weld, even on rusty, dirty steel. Produces a smooth bead which requires less grinding. Not recommended for aluminum engines. Yellow color coding on label. Required shielding gas: Argon/CO2. Recommended Polarity: DCEP Reverse Polarity. Tensile Strength (PSI): 70,000. Wt. 2 lb. Produce quality results on smaller amperage AC/DC welders. Low hydrogen content reduces cracking and peeling of the weld material. Features excellent restart capability. Designed for welding low, medium and high carbon steels as well as some higher strength low alloy steel. For frames, trailer hitches and chassis. Recommended Polarity: AC, DCEN, DCEP (Either Polarity). Diameter (Inches): 5/32" Weight Lbs. (Kg): 5 (2.26) Tensile Strength (PSI): 84,000 Amperage: 140-190 ER 70S-6 mild steel. Ideal for auto body repair and fabrication on most ferrous metals. Contains a high level of manganese and silicon for a superior weld, even on rusty, dirty steel. Produces a smooth bead which requires less grinding. Not recommended for aluminum engines. Yellow color coding on label. Required shielding gas: Argon/CO2. Recommended Polarity: DCEP Reverse Polarity. Tensile Strength (PSI): 70,000. Wt. 2 lb. 8.5" (215.9mm) long brass body with fiberglass cover and trigger. Accepts up to #2 welding cable and 5/32" (3.97mm) electrodes. Provides excellent conductivity and durability. Insulated for safety and maximum operator protection. Grooved jaws allow electrodes to be used at different angles for greater comfort and efficiency. Features copper shells machined from solid bar stock (not tubing). Thick shell flange. Extra heavy duty shell end where the tip takes the mose abuse. Larger diameter decreases preheat time and maintains the cut on painted or rusty plates. Course "V" splines which cuts better, resists clogs and makes cleaning easier. Heavy duty tips fit "Forney " 1711 torch kit and similar "Victor" compatible equipment. These MIG pliers includes seven features for MIG welding applications. The features include: (1) Needle nose pliers grip for pulling, (2) Small serrated hole for MIG tips, (3) Flat surfaces for hammering, (4) Cutter to trim MIG wire, (5) large serrated hole for nozzle, (6) Spring loaded handle and (7) Heavy insulated comfort grip. Featuring 2" (50.8mm) x 4-1/4" (107.95mm) #5 shade hardened lens with clear glass cover lens. Meets ANSI Z87.1 safety standards. Conforms comfortably to the head and allows ample room to fit over regular eye glasses. Provides 99.9% UV protection. DESIGNED FOR GAS WELDING ONLY. For #2 thru #6 welding cable. Cable splicer for permanently splicing damaged or broken cables and adding additional cable length to existing welding cable leads. Premium side-split leather palm and back. Heat and abrasion resistant reinforced patches in key strategic areas for added protection. Extended Gauntlet safety cuff offers extra wrist and forearm protection. Fortified with heat resistant Kevlar thread for added durability and wear. Cotton foam lining for moisture absorption and heat protection. Self-hemmed welting in seams to provide extra strength to seams adding durability and strength. Forney?s emblem imprint on glove. Premium side-split leather palm and back. Heat and abrasion resistant reinforced patches in key strategic areas for added protection. Extended Gauntlet safety cuff offers extra wrist and forearm protection. Fortified with heat resistant Kevlar thread for added durability and wear. Cotton foam lining for moisture absorption and heat protection. Self-hemmed welting in seams to provide extra strength to seams adding durability and strength. Forney?s emblem imprint on glove. E7018 mild steel welding rod easily produce quality results on smaller amperage AC/DC welders; suitable for all positions on harden steels where no preheat is used and on cold rolled steels normally exhibiting excessive porosity when welded with conventional rod; the low hydrogen content reduces cracking and peeling of the weld material; features excellent restart capability; designed for welding low, medium and high carbon steels as well as some higher strength low alloy steel; for frames, trailer hitches and chassis. Recommended Polarity: AC, DCEN, DCEP (Reverse). Tensile Strength (PSI): 84,000. Amperage: 100-140 on sku #s (890.9624, 890.9632) Amperage: 140-190. E6011 an all-position rod with strong arc force for deep penetration; fast metal solidification facilitates welding in vertical and overhead positions; light slag allows for easy clean-up; excellent for rusty steel because of the strong arc force; useful for galvanized tanks, steel casting and pressure pipe. Recommended polarity: AC, DCEP, DCEN (Either Polarity). Tensile Strength (PSI): 88,000. Amperage: 25-75 on sku #s (890.9665, 890.9673, 890.9681) Amperage: 35-125 on sku #s (890.9707, 890.9715, 890.9723) Amperage: 50-160. Features 5% magnesium content and a bright finish. It flows freely at 1,180 degrees F (637.8 degrees C) and provides less "bird-nesting" on push-type MIG welders. Applications include diesel engine bases, truck frames, cargo tanks and gun mount bases. Light Grey color coding on label. Required Shielding Gas: Argon. Recommended Polarity: DCEP Reverse. Tensile Strength (PSI): 63,000. A self-shielded mild steel all position flux cored MIG welding wire. Suited to single pass applications with high travel speed. Moderate to low spatter. Although no gas is required, an Argon/CO2 mix will reduce spatter. Excellent on thin gauge mild steel. Pink color coding on label. Required Shielding Gas: None. Recommended Polarity: DCEN Straight. Tensile Strength (PSI): 79,000. Heavy duty, vinyl pin-type design electrical plug with two brass blades and half pin. 30/50 Amp, 250 Volt capacity. Has extra blade to convert to 30 Amp plug. NEMA 6-30, 6-50. Heavy duty bakelite pin-type design wall electrical receptacle with 2-pole/3-wire grounding for surface mounting. 50 Amp, 125/250V capacity. NEMA 6-50. An orifice/bore gas concentration nozzle. Fits "Forney", "Tweco" and "Clarke" style MIG guns. Suitable for medium to heavy duty applications. An orifice/bore gas concentration nozzle. Fits "Forney", "Tweco" and "Clarke" style MIG guns. Suitable for medium to heavy duty applications. Complete assembly with pin-type headgear and 15-1/2" (393.7mm) x 8" (203.2mm) clear grinding shield. Lightweight design for maximum comfort. Tough non-warping red polyethylene visor. Meets ANSI Z87.1 safety standards. NOT TO BE USED FOR OXY-ACETYLENE WELDING. "Forney" 58602 (sku # 891.0283) is replacement clear shield. E71T-GS flux core MIG (GMAW) welding wire for mild steel. Best suited to single pass applications with high travel speed. Moderate to low spatter. Although no gas is required, an Argon/CO2 mix will reduce spatter. Excellent on thin gauge mild steel. Pink color coding on label. Required Shielding Gas: None. Recommended Polarity: DCEN Straight. Tensile Strength (PSI): 79,000. Wt 2 lb. Formulated for high tensile strength and ductility. Smooth flowing. Excellent for most brazing uses. Flux coated for best cleaning action. Yellow color coded. Tensile Strength: 65,000 PSI. Melting Point: 1,598? F (870? C). Heavy duty vinyl crowfoot-design electrical plug with three heavy duty brass blades. Has an extra blade to convert to 30A plug. NEMA 10-50, 10-30. 8.5" (215.9mm) long brass body with fiberglass cover and trigger. Accepts up to #2 welding cable and 3/16" (4.76mm) electrodes. Provides excellent conductivity and durability. Insulated for safety and maximum operator protection. Grooved jaws allow electrodes to be used at different angles for greater comfort and efficiency. 10-1/2" (266.7mm) long with 3-3/4" (95.3mm) maximum opening and 3" (76.2mm) depth. Extra clamping capacity for large objects. NOT TO BE USED FOR SCAFFOLDING OR OVERHEAD LIFTING. Use to connect "A" size fittings to "B" size fittings. Complete assembly with ratcheting-type headgear and 15-1/2" (393.7mm) x 8" (203.2mm) grinding shield. Lightweight design for maximum comfort. Tough non-warping polyethylene visor. Meets ANSI Z87.1 Safety Standards. Forney 58608 is replacement ratcheting-type headgear. Forney 58602 is replacement clear shield. NOT TO BE USED FOR OXY-ACETYLENE WELDING. Includes ratcheting-type headgear, lift front 2" (50.8mm) x 4-1/4" (107.95mm) heat treated #10 shade lens and clear glass protective lens. Lightweight, tough and durable; UV/IR protection. Meets ANSI Z87.1 safety standards. "Forney" 55674 (sku # 891.0085) is replacement ratcheting-type headgear. E4043 DC aluminum "AluminArc" specialty welding electrodes are the highest strength alloy for arc and torch welding of low alloy aluminum. Excellent for cast, wrought and extruded aluminum in all positions. Can also be used as a torch brazing alloy. Typical applications include truck beds, loading ramps and docks, banisters, stairs, diamond plate, irrigation piping, engine blocks, transmission housings and railroad frogs. Recommended Polarity: DC Reverse. Weight Lbs. (Kg): .5 (.22). Amperage: 70-120. Quick connectors for #1 through #4 welding cable extensions. Heat and oil resistant covers. E6011 an all-position rod with strong arc force for deep penetration; fast metal solidification facilitates welding in vertical and overhead positions; light slag allows for easy clean-up; excellent for rusty steel because of the strong arc force; useful for galvanized tanks, steel casting and pressure pipe. Recommended polarity: AC, DCEP, DCEN (Either Polarity). Tensile Strength (PSI): 88,000. Amperage: 25-75 on sku #s (890.9665, 890.9673, 890.9681) Amperage: 35-125 on sku #s (890.9707, 890.9715, 890.9723) Amperage: 50-160. Includes ratcheting-type headgear, 5-1/4" (133.35mm) x 4-1/2" (114.3mm) heat treated #10 shade lens and clear glass protective lens. Lightweight, tough and durable; UV/IR protection. Meets ANSI Z87.1 safety standards. "Forney" 55674 (sku # 891.0085) is replacement ratcheting-type headgear. General purpose rod with medium to shallow penetration. Medium to heavy slag is easily removed. Excellent for poorly fitted joints. Smaller sizes of rod are well suited to low heat on thin metals. Use on all types of mild steel. Great for light gauge metal, sheet metal, duct work, etc. Recommended Polarity: AC, DCEP, DCEN (Either Polarity). Tensile Strength (PSI): 83,000 Amperage: 70-110. "High Deposition" is an iron powder-type electrode with medium to shallow penetration. It is known for smooth arc characteristics, good arc stability and low spatter. Excellent for sheet metal and ornmental iron work on poorly fitted joints. Use anywhere ease of operation and good appearance are required. Recommended Polarity: AC, DCEP, DCEN (Either Polarity). Tensile Strength (PSI): 83,000; Amperage: 110-140. For use in welding applications or for holding awkward shapes in place. U- shaped jaws provide enhanced visibility and more working space. Turn screw to adjust pressure and fit work. Stays adjusted for repetitive use. Constructed of high-grade heat-treated alloy steel for maximum toughness and durability. Guarded release trigger quickly unlocks and protects from accidental release. Throat depth 1-3/4", Jaw capacity 1-5/8"; Jaw depth 1-3/4". E6011 an all-position rod with strong arc force for deep penetration; fast metal solidification facilitates welding in vertical and overhead positions; light slag allows for easy clean-up; excellent for rusty steel because of the strong arc force; useful for galvanized tanks, steel casting and pressure pipe. Recommended polarity: AC, DCEP, DCEN (Either Polarity). Tensile Strength (PSI): 88,000. Amperage: 25-75 on sku #s (890.9665, 890.9673, 890.9681) Amperage: 35-125 on sku #s (890.9707, 890.9715, 890.9723) Amperage: 50-160. E7018 mild steel welding rod easily produce quality results on smaller amperage AC/DC welders; suitable for all positions on harden steels where no preheat is used and on cold rolled steels normally exhibiting excessive porosity when welded with conventional rod; the low hydrogen content reduces cracking and peeling of the weld material; features excellent restart capability; designed for welding low, medium and high carbon steels as well as some higher strength low alloy steel; for frames, trailer hitches and chassis. Recommended Polarity: AC, DCEN, DCEP (Reverse). Tensile Strength (PSI): 84,000. Amperage: 100-140 on sku #s (890.9624, 890.9632) Amperage: 140-190. Stainless steel Easy-All 312-16. Weld construction and pre-hardened tool steels and specialized iron-base castings w/high-carbon content. Mineral coated high-alloy steel that can be used by anyone - regardless of experience. Made from high grade steel so it's reusable. Four different cuts from each guide: Saddle cut, 45 degree, 22-1/2 degree and 90 degree. Includes a spring loaded hinge. Painted red. Made from high grade steel so it's reusable. Four different cuts from each guide: Saddle cut, 45 degree, 22-1/2 degree and 90 degree. Includes a spring loaded hinge. Painted red. E7018 AC mild steel welding rod easily produce quality results on smaller amperage AC/DC welders; suitable for all positions on hardened steels where no preheat is used and on cold rolled steels normally exhibiting excessive porosity when welded with conventional rod; the low hydrogen content reduces cracking and peeling of the weld material; features excellent restart capability; designed for welding low, medium and high carbon steels as well as some higher strength low alloy steel; for frames, trailer hitches and chassis. Recommended Polarity: AC, DCEN, DCEP (Either Polarity). Tensile Strength (PSI): 84,000. Amperage: 65-100 on the 10 LB rods 140-190. Individual electrode (rod) weighs .50 lbs (.75 oz). E6010 an all-purpose electrode used in all positions; a deep penetrating rod for carbon and galvanized steel; E6010 is for use with a DC welder and runs on DCEP; ideal for welding through light to medium amounts of dirt, rust or paint. Recommended Polarity: DCEP (Reverse Polarity). Tensile Strength (PSI): 80,000. Amperage: 35-125. 8" (203.2mm) long with 2" (50.8mm) jaw opening. Accepts up to #1/0 welding cable. Rugged, versatile, wide jaw ground clamp. Good for most grounding situations. Large contact surface area provides good cable connections and positive grounding. Full grain palm and back. Heat and abrasion resistant reinforced patches in key strategic areas for added protection. 5" split leather reinforced safety cuff offers extra wrist and forearm protection. Fortified with heat resistant Kevlar thread for added durability and wear. Self-hemmed welting's in seams to provide extra strength to seams adding durability and strength to the glove. Forney?s emblem imprint on glove. Suitable for use with oxygen-acetylene only. Red hose for acetylene. Green hose for oxygen. use with acetylene fuel gas only. Resists kinks, heat, weather and solvents. Bleed hoses when not in use for at least 30 minutes. Couple with one inch ferrules only. Includes standard "B" fittings. Quick connectors for #1 through #4 welding cable extensions. Heat and oil resistant covers. Premium grade full grain palm and back; heat and abrasion resistant reinforced patches in key strategic areas for added protection; 5" split leather reinforced safety cuff offers extra wrist and forearm protection; fortified with heat resistant Kevlar thread for added durability and wear; self-hemmed welting's in seams to provide extra strength to seams adding durability and strength to the glove; "Forney" embossed on glove. 7-3/8" (187.3mm) long with 1-1/2" (38.1mm) jaw opening. Accepts up to #2 welding cable. Includes shim stock and wrench. For heavy duty use. Large contact area assures positive grounding. Oval-point screw cable connections make installation easy, assuring good, safe cable connections. Wide grooved jaws for positive ground. ER 70S-6 mild steel. Ideal for auto body repair and fabrication on most ferrous metals. Contains a high level of manganese and silicon for a superior weld, even on rusty, dirty steel. Produces a smooth bead which requires less grinding. Not recommended for aluminum engines. Yellow color coding on label. Required shielding gas: Argon/CO2. Recommended Polarity: DCEP Reverse Polarity. Tensile Strength (PSI): 70,000. Wt. 10 lb. ER 70S-6 mild steel. Ideal for auto body repair and fabrication on most ferrous metals. Contains a high level of manganese and silicon for a superior weld, even on rusty, dirty steel. Produces a smooth bead which requires less grinding. Not recommended for aluminum engines. Yellow color coding on label. Required shielding gas: Argon/CO2. Recommended Polarity: DCEP Reverse Polarity. Tensile Strength (PSI): 70,000. Wt. 10 lb. Ideal for auto body repair and fabrication on most ferrous metals. Contains a high level of manganese and silicon for a superior weld, even on rusty, dirty steel. Produces a smooth bead which requires less grinding. Not recommended for aluminum engines. Yellow color coding on label. Required Shielding Gas: Argon/CO2. Recommended Polarity: DCEP Reverse Polarity. Tensile Strength (PSI): 70,000. Consists of 20% chromium and 10% nickel. Welds type 301, 302, 304, 308, 321 and 347 stainless steel. Applications include the food and beverage industry, maintenance and repair. Blue color coding on label. Required Shielding Gas: Argon or Argon/CO2. Recommended Polarity: DCEP Reverse. Tensile Strength (PSI): 79,000. "Victor" compatible oxygen-acetylene heating tip. Size 8 (8-MFA-1). Fits "Forney" 1680, 1702, 1705 (sku #: 890.9442), 1707 and 1753 (sku #: 891.2776) torch kits and "Victor" compatible light and medium duty equipment. Suitable for use with oxygen-acetylene only. Red hose for acetylene. Green hose for oxygen. use with acetylene fuel gas only. Resists kinks, heat, weather and solvents. Bleed hoses when not in use for at least 30 minutes. Couple with one inch ferrules only. Includes standard "B" fittings. Contains 2-each Forney 70853, White, 70856, Red, and 70858, Green; and 1-each 70854, Black, 70855, Blue, and 70857, Yellow. Made in USA. Great for indoor or outdoor holiday decorating, announcing special events, and many other uses. Temporary window marker for use on glass, metal, and most other non-porous surfaces. Weather resistant, dries quickly, and removes easily. To remove paint, spray with an all-purpose cleaner, briefly soak, and rub vigorously with a wet cloth or paper towel. Use only as directed. Not intended for use on clothing, convertibles or car paint, rubber, textiles, paper, and other porous surfaces. May stain clothing. (8 MFA). Fits Forney 1711 torch kit and Victor compatible heavy duty equipment. Suitable for use with propane, propylene and MAPP gas. Features neoprene coating inside and out to resist corrosion from oil and petroleum-based fuel gases. Resists kinks, heat, weather and solvents. Bleed hoses when not in use for at least 30 minutes. Couple with one inch ferrules only. Includes standard "B" fittings. Wheel and handle kit for "Forney" 00313 & 00314 ARC Welders (sku #: 890.9400). A self-shielded mild steel all position flux cored MIG welding wire. Suited to single pass applications with high travel speed. Moderate to low spatter. Although no gas is required, an Argon/CO2 mix will reduce spatter. Excellent on thin gauge mild steel. Pink color coding on label. Required Shielding Gas: None. Recommended Polarity: DCEN Straight. Tensile Strength (PSI): 79,000. Medium duty "Victor" compatible oxy-acetylene torch handle. Includes check valves. Two (2) stainless steel needle valves for fast accurate flame adjustment. Enhanced wall thickness provides strength and durability. No screws or soldered joints for enhanced durability and ease of maintenance. Made from tough extruded brass. Fits "Forney" 01680, 01705 (sku #: 890.9442) and 01707 torch kits. A self-shielded mild steel all position flux cored MIG welding wire. Suited to single pass applications with high travel speed. Moderate to low spatter. Although no gas is required, an Argon/CO2 mix will reduce spatter. Excellent on thin gauge mild steel. Pink color coding on label. Required Shielding Gas: None. Recommended Polarity: DCEN Straight. Tensile Strength (PSI): 79,000. Ideal helmets for hobbyists and beginner welders; SHELL AND HEADGEAR FEATURES: Lightweight (less than 1 lb. ), impact resistant, fireproof shell; quick-fit, 5-point adjustable geared headband with sweatband mechanism greatly reudces head/neck strain and general fatigue caused by repeated lowering of the helmet during day-to-day welding operations. AUTO-DARKENING FILTER (ADF) FEATURES: - 5.97 sq. in. (3.62" x 1.65") viewing area; DIN 9 to 13 variable shade selection (TIG operable to 15 amps); two optical arc sensors help protect against the hazards of arc flash; 1/1/1/2 optical clarity rating; UV/IR coating to reduce scratching and discoloration of the lens; 1/16,000 per second switching speed; cheater/magnifying lens compatible design. ADDITIONAL FEATURES: - external shade selector knob with grind option allows for quick shade modifications. Internal switch controls include both sensitivity (high-low) and delay (min.-max.) adjustments. Solar cells with non-replaceable 3V lithium batteries and automatic on/off technology. Meets all related CE standards (DIN and ISO), EN166, EN175, EN379, ANSI Z87.1, CSA Z94.3, AS/NZS1337 and AS/NZS1338 safety standards. 17 cc's permanent opaque colors for most surfaces. Ideal helmets for hobbyists and beginner welders; SHELL AND HEADGEAR FEATURES: Lightweight (less than 1 lb. ), impact resistant, fireproof shell; quick-fit, 5-point adjustable geared headband with sweatband mechanism greatly reudces head/neck strain and general fatigue caused by repeated lowering of the helmet during day-to-day welding operations. AUTO-DARKENING FILTER (ADF) FEATURES: - 5.97 sq. in. (3.62" x 1.65") viewing area; DIN 9 to 13 variable shade selection (TIG operable to 15 amps); two optical arc sensors help protect against the hazards of arc flash; 1/1/1/2 optical clarity rating; UV/IR coating to reduce scratching and discoloration of the lens; 1/16,000 per second switching speed; cheater/magnifying lens compatible design. ADDITIONAL FEATURES: - external shade selector knob with grind option allows for quick shade modifications. Internal switch controls include both sensitivity (high-low) and delay (min.-max.) adjustments. Solar cells with non-replaceable 3V lithium batteries and automatic on/off technology. Meets all related CE standards (DIN and ISO), EN166, EN175, EN379, ANSI Z87.1, CSA Z94.3, AS/NZS1337 and AS/NZS1338 safety standards. Ideal helmets for hobbyists and beginner welders; SHELL AND HEADGEAR FEATURES: Lightweight (less than 1 lb. ), impact resistant, fireproof shell; quick-fit, 5-point adjustable geared headband with sweatband mechanism greatly reudces head/neck strain and general fatigue caused by repeated lowering of the helmet during day-to-day welding operations. AUTO-DARKENING FILTER (ADF) FEATURES: - 5.97 sq. in. (3.62" x 1.65") viewing area; DIN 9 to 13 variable shade selection (TIG operable to 15 amps); two optical arc sensors help protect against the hazards of arc flash; 1/1/1/2 optical clarity rating; UV/IR coating to reduce scratching and discoloration of the lens; 1/16,000 per second switching speed; cheater/magnifying lens compatible design. ADDITIONAL FEATURES: - external shade selector knob with grind option allows for quick shade modifications. Internal switch controls include both sensitivity (high-low) and delay (min.-max.) adjustments. Solar cells with non-replaceable 3V lithium batteries and automatic on/off technology. Meets all related CE standards (DIN and ISO), EN166, EN175, EN379, ANSI Z87.1, CSA Z94.3, AS/NZS1337 and AS/NZS1338 safety standards. Includes check valves. Two stainless steel needle valves for fast accurate flame adjustment. Enhanced wall thickness provides strength and durability. No screws or soldered joints for enhanced durability and ease of maintenance. Made from tough extruded brass. Fits Forney 01711 torch kit. Victor compatible. "Verstile Victor" compatible oxygen regulator for meduim duty applications. Forged brass bodies and bonnets for maximum strength. Sintered (heat-treated) metal inlet filter to trap impurities. Pressed, not soldered, joints for easy maintenance. Easy to read dual scale gauges with nearly unbreakable screw-on-lenses. Includes a safety relief valve for safe operation. Included in "Forney" 01705 (sku #: 890.9442), "Shop Flame II" and 01707 "Deluxe" Oxy-Acetylene Welding Kits. Suitable for use with propane, propylene and MAPP gas. Features neoprene coating inside and out to resist corrosion from oil and petroleum-based fuel gases. Resists kinks, heat, weather and solvents. Bleed hoses when not in use for at least 30 minutes. Couple with one inch ferrules only. Includes standard "B" fittings. General purpose rod with medium to shallow penetration. Medium to heavy slag is easily removed. Excellent for poorly fitted joints. Smaller sizes of rod are well suited to low heat on thin metals. Use on all types of mild steel. Great for light gauge metal, sheet metal, duct work, etc. Recommended Polarity: AC, DCEP, DCEN (Either Polarity). Tensile Strength (PSI): 83,000 Amperage: 70-110. General purpose rod with medium to shallow penetration. Medium to heavy slag is easily removed. Excellent for poorly fitted joints. Smaller sizes of rod are well suited to low heat on thin metals. Use on all types of mild steel. Great for light gauge metal, sheet metal, duct work, etc. Recommended Polarity: AC, DCEP, DCEN (Either Polarity). Tensile Strength (PSI): 83,000 Amperage: 70-110. Victor compatible. Double o-ring seal for quick, leak-free, hand-tight connections. Head and body are made from forged brass for longer life. Fits Forney 01711 torch kit. Fits "Forney" 300 series welders and plasma cutters and all similar sized welders. 11-1/2" wide x 27-1/2" tall. 3-levels. Four casters included. 1.0mm thick steel. Max recommended weight capacity: 90 lbs (40.8 Kg). Ideal helmets for intermediate or advance welders; SHELL AND HEADGEAR FEATURES: Lightweight (approximately 1 lb. ), high impact resistant nylon shell, quick-fit, 5-point adjustable geared headband with sweatband mechanism greatly reudces head/neck strain and general fatigue caused by repeated lowering of the helmet during day-to-day welding operations. AUTO-DARKENING FILTER (ADF) FEATURES: - 7.70 sq. in. (3.93" x 1.96") viewing area; DIN 9 to 13 variable shade selection (TIG operable to 8 amps); four optical arc sensors optimize arc detection and reduce the risk of blocked sensors during out-of-position welding detection; 1/1/1/2 optical clarity rating; UV/IR coating to reduce scratching and discoloration of the lens; 1/16,000 per second switching speed; cheater/magnifying lens compatible design. ADDITIONAL FEATURES: - external shade selector knob with grind option allows for quick shade modifications. Internal switch controls include both sensitivity (high-low) and delay (min.-max.) adjustments. Solar cells with 2-each replaceable 3V lithium batteries and automatic on/off technology. Meets all related CE standards (DIN and ISO), EN166, EN175, EN379, ANSI Z87.1, CSA Z94.3, AS/NZS1337 and AS/NZS1338 safety standards. Forged brass bodies and bonnets for maximum strength. Sintered (heat-treated) metal inlet filter to trap impurities. Pressed, not soldered, joints for easy maintenance. Easy to read dual scale gauges with nearly unbreakable screw-on lenses. Includes a safety relief valve for safe operation.Victor compatible. Forged brass bodies and bonnets for maximum strength. Sintered (heat-treated) metal inlet filter to trap impurities. Pressed, not soldered, joints for easy maintenance. Easy to read dual scale gauges with nearly unbreakable screw-on lenses. Victor compatible. The optimal helmets for professional welders; SHELL AND HEADGEAR FEATURES: Lightweight (approximately 1 lb. ), high impact resistant nylon shell, quick-fit, 5-point adjustable geared headband with sweatband mechanism greatly reudces head/neck strain and general fatigue caused by repeated lowering of the helmet during day-to-day welding operations. AUTO-DARKENING FILTER (ADF) FEATURES: - 9.144 sq. in. (3.81" x 2.4") large viewing area; advanced optical technology provides ultra-high viewing definition of arc and puddle; DIN 5 to 8 cutting, low current welding; adjustable shades 5 to 9 for TIG process low intensity, oxyacetylene welding - 9 to 13 variable shade selection (TIG operable to 5 amps); four optical arc sensors optimize arc detection and reduce the risk of blocked sensors during out-of-position welding detection; 1/1/1/1 optical clarity rating; UV/IR coating to reduce scratching and discoloration of the lens; 1/20,000 per second switching speed; cheater/magnifying lens compatible design. ADDITIONAL FEATURES: - internal shade selector with grind option improves chances of accidental setting changes. Internal step-less controls include both sensitivity (high-low) and delay (min.-max.) adjustments. Solar cells with 2-each replaceable 3V lithium batteries and automatic on/off technology. Meets all related CE standards (DIN and ISO), EN166, EN175, EN379, ANSI Z87.1, CSA Z94.3, AS/NZS1337 and AS/NZS1338 safety standards. Includes 6 each "Forney" 70824 (sku #: 891.5100) and 70825 (sku #: 891.5118); 8 each - 70820 (sku #: 891.5084) and 70822 (sku #: 891.5092); 10 each - 70818 (sku #: 891.5068) and 70819 (sku #: 891.5076); plus FREE 6-Chamber display. Stick welder/TIG capable (TIG torch not included); welds 16 gauge up to 5/16"; handles up to 1/8" electrode; 120V input, 90A output. Gasless/flux-core welding only; 120V input, 125A output; welds 24 gauge up to 1/4"; handles .030" wire. Highly flexible cable manufactured with 1,007 strands of fully annealed soft-drawn copper. Uses paper separator between copper and outer EPDM jacket. Will not kink, even in cold weather. Outer jacket has excellent oil, grease, water, flame, tear, cut and abrasion resistance. Rated at 600 volts. Conductor temperature range of -58? F (-50? C) to 221? F (105? C). Meets or exceeds ASTMB-172. 50' (15.24m) reel. Gasless/flux-core welding only. Welds 24-gauge up to 1/4 in. Handles .030 in. wire. #4 gauge highly flexible welding cable manufactured with 378 strands of fully annealed soft-drawn copper. Uses paper separator between copper and outer EPDM jacket. Will not kink, even in cold weather. Outer jacket has excellent oil, grease, water, flame, tear, cut and abrasion resistance. Rated at 600 volts.Conductor temperature range of -58? F (-50? C) to 221? F (105? C). Meets or exceeds ASTMB-172. "Victor" compatible medium duty oxy-acetylene welding kit. Welds up to 3/8" (9.52mm) and cuts up to 6" (152.4mm). Provided with check valves for safety. Has 3/16" (4.76mm) x 20' (6.1m) T-grade hose. Ideal for maintenance, fabrication, plumbing and do-it yourselfers. Kit includes: Oxygen Regulator (SKU #: 891.2677); Acetylene Regulator (SKU # 891.2685); Torch Handle (SKU # 891.2701); Cutting Attachment (SKU # 891.2693); Goggles (SKU # 891.0036); Flint Lighter (SKU # 891.2586); T-Grade Hose (SKU # 891.5373); Cutting Tip #0 (SKU # 891.0812); Welding Tip #0 (Forney #87822); Check Valves (Forney #87151). "Victor" compatible lightweight torch kit that welds up to 1/2" (12.7mm) and cuts up to 4" (101.6mm); ideal for auto repair, plumbing, refrigeration, metal art, general and industrial maintenance; easy to store and can be carried from job-to-job; all accessories fit comfortably in a light sturdy plastic tote; all tanks are shipped empty per DOT regulations. Kit includes: Oxygen Regulator (Forney #86230); Acetylene Regulator (Forney #86229); Torch Handle (sku # 891.2701); Cutting Attachment (sku # 891.2693); Goggles (sku # 891.0036); Flint Lighter (sku # 891.2586); T-Grade Hose (sku # 891.5373); Cutting Tip #0 (sku #891.0812); Welding Tip #0 (Forney #82822); Oxygen Cylinder (Forney #86224); Acetylene Cylinder (Forney #86228); Check Valves (Forney #87151); Plastic Tote (Forney #86221). #2 gauge highly flexible welding cable manufactured with 636 strands of fully annealed soft-drawn copper. Uses paper separator between copper and outer EPDM jacket. Will not kink, even in cold weather. Outer jacket has excellent oil, grease, water, flame, tear, cut and abrasion resistance. Rated at 600 volts. Conductor temperature range of -58? F (-50? C) to 221? F (105? C). Meets or exceeds ASTMB-172. Multi-Process welder: MIG/DC TIG/Stick welder (TIG torch not included). Welds up to 5/16 in. Uses gasless wire .030/.035 in. Solid wire .024/.030 in. Up to 1/8 in. stick electrode. Cuts up to 1/4 in. of mild steel. "Victor" compatible heavy duty oxy-acetylene welding kit. Welds up to 1/2" (12.7mm) and cuts up to 8" (203.2mm). Provided with check valves for safety and includes a 1/4" (6.35mm) x 20' (6.1m) T-Grade hose. Ideal for maintenance, fabrication, plumbing and do-it-yourselfers. Provides high performance at a very economical price. Kit includes: Oxygen Regulator (SKU # 891.5399); Acetylene Regulator (SKU # 891.5415); Torch Handle (SKU # 891.5431); Cutting Attachment (SKU # 891.5464); Goggles (SKU # 891.0036); Flint Lighter (SKU # 891.2586); T-Grade Hose (Forney # 86164); Cutting Tip #1 (SKU # 891.0887); Welding Tip #1 (Forney # 87833); Welding Tip #3 (Forney # 87835); Welding Tip #5 (Special Order only); Rosebud Tip #8 (SKU # 891.5472); Check Valves (Forney # 87151); Tip Cleaner (SKU # 891.2610). This welder has a duty cycle of 20% @ 230A, 50% @ 150A AC, 20% @ 180A and 35% @ 135A DC; the electroholder cable is 3m 25mm2, the earth clamp cable is 2m 25mm2, both with dense connector. Input cable American Wire Gauge (AWG) 10, 2.5mm. 50A plug. CSA-approved. Cat #00329, wheel & handle kit for "Forney" 00313 & 00314 must be purchased separately. Weight: 116 lbs (52.62Kg). Machine for farming, automotive and small welding repair; it runs off household 115V power and offers a duty cycle of 115A @ 20%, 90A @ 35%, 60A @ 60% and 55A @ 100%; the Euro connect Torch with "Tweco" style consumables makes this machine easy to use; the 8" power cord and 10" MIG gun offers 18 feet of work area; better wire feeding is ensured with our cast aluminum wire drive system and dual geared idler and drive roll with de-spooler; the larger cabinet space allows for easier access to 4" and 8" spools; the improved design offers integrated feet and a torch wrap for cable organization. Specifications: Processes: MIG (GMAW); Flux Cored (FCAW). Input Power: 115V. Amperage Range: 30-140A, DC CV. Wire Diameter Range: .023" - .035". Plate Thickness Range: 24 ga. - 1/4". Weight: 57 lbs. Dimensions: 19" x 9.5" x 16.5". Duty Cycle: 115A, 19.75V @ 20%, 90A, 18.5V @ 35%. Regulator and gas hose; offers a Euro Connect Torch and fast disconnect to swap out torch and clean liner; larger cabinet space allows easy access to 4" (1-2lbs) and 8" (10-11lbs) spools; perfect for farms, automotive and repair welding and permits a 25' working envelope with its 10' torch and 15' power cord; the wire feeding is smooth and consistent as this welder has a cast aluminum wire drive system and dual geared idler and drive roll with de-spooler; the improved design offers integrated feet and torch wrap for cable organization. Specifications: Processes: MIG (GMAW); Flux Cored (FCAW). Input Power: 230V. Amperage Range: 30-190A, DC CV. Wire Diameter Range: .023" - .035". Rated Output: 120A @ 25% Duty Cycle. Plate Thickness Range: 24 ga. - 3/8". Weight: 63 lbs. Dimensions: 19" x 9.5" x 16.5". Duty Cycle: 140A, 21V @ 15% 120A, 20V @ 25%. Uses an electrical arc and compressed air to cut steel, aluminum and other conductive metals. Drag Torch technology allows you to move (drag) the torch directly across the metal surface for more precise cuts with or without a template. Designed to cut up to 1/8" (3.18mm) mild steel (excels at cutting sheet metal). Can sever up to 1/4" (6.35mm) steel. Uses standard household 115 VAC current. Includes Torch with 13.2' (4m) lead; 13.2' (4m) Ground Cable with 200 Amp Ground Clamps; and 7.4' (2.25m) Input Power Cable with 15 Amp NEMA 5-15P Plug. Plasma Cutter comes with a built-in piston driven compressor and lightweight inverter power supply; Thermal Overload Protection (rated for 35% duty cycle at 104 degrees F (40 degrees C)); Three (3) Diagnostic LED lights (power, temperature, & torch energized/ready to work); and Post-Flow air cooling (cools torch and tip after cutting). CSA certified. Specifications: Input: 120 VAC; 60 HZ; 12 Amp; 1-Phase; Output (Fixed): 25% @ 12 Amp; Absorbed Power: 22.5 Amps; Weight: 35 Lbs. (15.88Kg).